Within Banff National Park, 13 campgrounds hold more than 2,000 sites, making camping an easy and inexpensive way to enjoy the park. Although the town of Banff has five of these facilities with more than 1,500 sites in its immediate vicinity, most fill by early afternoon. The three largest campgrounds are strung out over 1.5 kilometers (0.9 mile) along Tunnel Mountain Road, with the nearest sites 2.5 kilometers (1.6 miles) from town. Sites at Tunnel Mountain Campground can be reserved through the Parks Canada Campground Reservation Service (877/737-3783, www.pccamping.ca), and it’s strongly recommended that you do reserve if you require electrical hookups. Although some sites are available for those without reservations, they fill fast each day (especially in July and August). The official checkout time is 11 a.m., so plan on arriving at your campground of choice earlier in the day than this to ensure getting a site. At more popular locations on summer weekends, a line forms, waiting for sites to become vacant. This is especially true at the Banff and Lake Louise campgrounds, which offer powered sites. When the main campgrounds fill, those unable to secure a site will be directed to an overflow area along Minnewanka Lake Road. These provide few facilities and no hookups but cost less. Open fires are permitted in designated areas throughout all campgrounds, but you must purchase a Firewood Permit ($8 per site per night) to burn wood, which is provided at no cost. 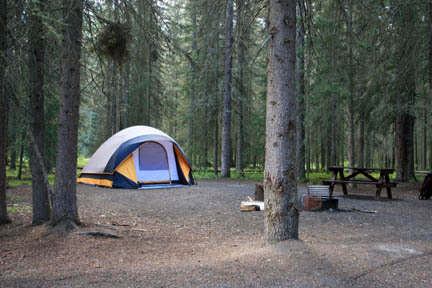 For general camping information, stop at the Banff Visitor Centre (224 Banff Ave., 403/762-1550) or go the Parks Canada website, www.pc.gc.ca, and follow the links to Banff National Park. Closest to town is Tunnel Mountain Campground, which is three campgrounds rolled into one. The location is a lightly treed ridge east of downtown, with views north to Cascade Mountain and south to Mount Rundle. From town, follow Tunnel Mountain Road east, to beyond the Douglas Fir Resort (which is within walking distance for groceries, liquor, and laundry). If you’re coming in off the TransCanada Highway from the east, bypass town completely by turning left onto Tunnel Mountain Road at the Banff Rocky Mountain Resort. Approaching from this direction, the first campground you pass is the park’s largest, with 622 well-spaced, relatively private sites ($28 per site), each with a fire ring and picnic table. Other amenities include drinking water, hot showers, and kitchen shelters. This campground has no hookups. It is open mid-May to early September. Less than one kilometer (0.6 mile) farther along Tunnel Mountain Road toward town is a signed turnoff (Hookups) that leads to a registration booth for two more campgrounds. Unless you have a reservation from Parks Canada Campground Reservation Service (877/737-3783, www.pccamping.ca), you’ll be asked whether you require an electrical hookup ($32 per site) or a site with power, water, and sewer ($38 per site), then sent off into the corresponding campground. The power-only section (closest to town) stays open year-round, the other mid-May to September. Both have hot showers but little privacy between sites. Along Lake Minnewanka Road northeast of town are two campgrounds offering fewer services than the others, but with sites that offer more privacy. The pick of the two is Two Jack Lakeside Campground (June to mid-Sept., $32 per site), with 80 sites tucked into trees at the south end of Two Jack Lake, an extension of Lake Minnewanka. Facilities include hot showers, kitchen shelters, drinking water, and flush toilets. It’s just over six kilometers (3.7 miles) from the TransCanada Highway underpass. All sites at Two Jack Lakeside are reservable (877/737-3783, www.pccamping.ca). The much larger Two Jack Main Campground (mid-June to mid-Sept., $22 per site) is a short distance farther along the road, with 381 sites spread throughout a shallow valley. It offers the same facilities as Two Jack Lakeside, sans showers. The overflow camping area ($10) for these and the three Tunnel Mountain campgrounds is at the beginning of the Lake Minnewanka Road loop. 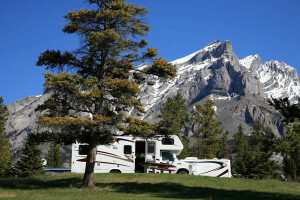 Along Bow Valley Parkway between the town of Banff and Lake Louise are two campgrounds. Closest to Banff is Johnston Canyon Campground (early June to mid-Sept., $28 per site), between the road and the rail line, 26 kilometers (16 miles) west of Banff. It is the larger of the two campgrounds, with 140 sites, and has hot showers but no hookups. It is within walking distance of Johnston Canyon Resort, with a café, restaurant, and the beginning of a trail to the park’s best-known waterfalls. Continuing eight kilometers (five miles) toward Lake Louise, Castle Mountain Campground (early June to early Sept., $22 per site) is also within walking distance of a grocery store (no restaurant), but it has just 44 sites and no showers. Services are limited to flush toilets, drinking water, and kitchen shelters. 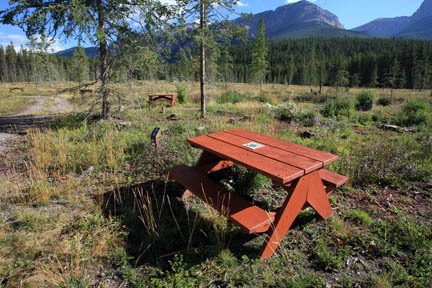 Protection Mountain Campground, a further 14 kilometers (8.7 miles) west and just over 20 kilometers (12.5 miles) from Lake Louise, has been closed since the 2011 camping season. It was originally closed to allow Parks Canada to clear trees that were deemed dangerous; the trees are gone, but there is no word on a reopening date. The photo below was taken in the summer of 2014, showing picnic tables still in place.